The Foo Fighters performed their new single, “The Line”, on the daytime talk show Ellen on May 11, and video from the program is streaming online. Frontman Dave Grohl has previously described the song as “a search for hope in this day and age where you feel as if you’re fighting for your life with every passing moment, and everything is on the line." The tune follows “Run” and “The Sky Is A Neighborhood” as the third track issued from the band’s ninth album, “Concrete And Gold”, which debuted at No. 1 on the US Billboard 200 upon its release last fall. The project earned the Foo Fighters a 2018 Grammy Award in the “Best Rock Song” category – a songwriters award – for “Run”, while the tune lost out in the “Best Rock Performance” field to a song by sentimental favourite Leonard Cohen. 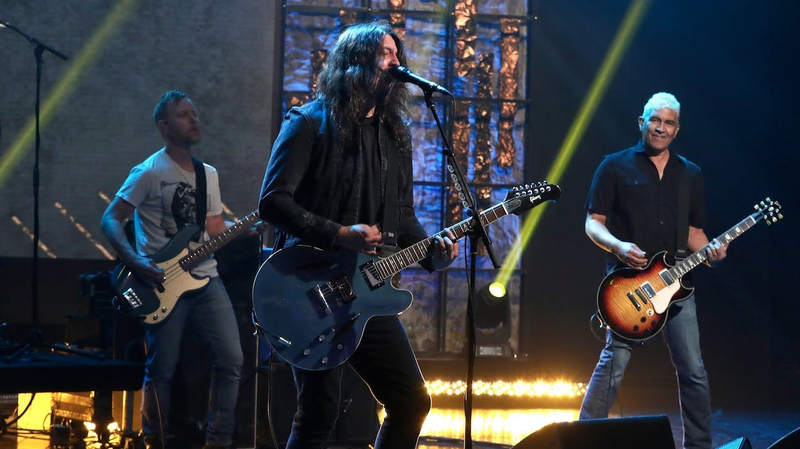 The Ellen appearance comes a week after the Foo Fighters wrapped up a brief 3-week spring run of US dates and ahead of the start of a European tour in Germany next month.